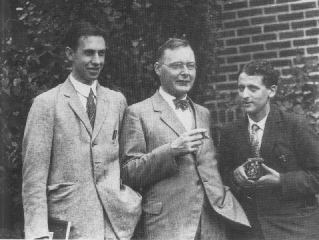 This photograph was taken around 1928 in Ann Arbor, three years after George Uhlenbeck (left) and Samuel Goudsmit (right) proposed the idea that each electron spins with an angular momentum of one half Planck constant and carries a magnetic moment of one Bohr magneton. At the time of their discovery, Uhlenbeck and Goudsmit were studying in Leiden with Paul Ehrenfest. At the center is Hendrik Kramers, another of Ehrenfest's students. The discovery note in Naturwissenschaften is dated Saturday 17 October 1925. One day earlier Ehrenfest had written to Lorentz to make an appointment for the coming Monday to discuss a "very witty idea" of two of his graduate students. When Lorentz pointed out that the idea of a spinning electron would be incompatible with classical electrodynamics, Uhlenbeck asked Ehrenfest not to submit the paper. Ehrenfest replied that he had already sent off their note, and he added: "You are both young enough to be able to afford a stupidity!" Ehrenfest's encouraging response to his students ideas contrasted sharply with that of Wolfgang Pauli. As it turned out, Ralph Kronig, a young Columbia University PhD who had spent two years studying in Europe, had come up with the idea of electron spin several months before Uhlenbeck and Goudsmit. He had put it before Pauli for his reactions, who had ridiculed it, saying that "it is indeed very clever but of course has nothing to do with reality". Kronig did not publish his ideas on spin. No wonder that Uhlenbeck would later refer to the "luck and privilege to be students of Paul Ehrenfest". Goudsmit's own story about the discovery.